The OUTLANDER industrial tent is the entry level of the industrial tents category. It offers solid basic equipment and can be used throughout the year. The fully galvanized steel frame with a fixing ground frame and reinforcing steel elements in the roof, withstands wind and weather. For more stability, all legs are bolted together twice and fastened on extra large foot plates on the ground. The high-quality, approx. 550g/m² PVC tarpaulin with tear-resistant patterned internal fabric protects goods from wind and weather throughout the year. The PVC tarpaulin weighs approx. The roof and side panels consist of one piece and ensures a higher stability. Due to the integrated steel wires, the tarpaulin is aligned and tensioned. Even a later readjustment of the tarpaulin is no problem. The storage tent is ideal as a storage or working area and thus offers an inexpensive alternative to solid structures. In addition, this storage tent includes a statics handbook and a corresponding enforcement set. The structure according to the manual / handbook guarantees the wind or snow loads. Our industrial tents experts will happily advise you on the telephone number: 0118 31 50 873. This tent frame is certainly progressing, defying wind and weather and is designed for year-round use. The extraordinary stability is due to the professional storage tent with approx. 50% more steel, installed in its extra strong standing poles and the additional reinforcing elements in the roof and ground area. Precipitation and weather-related forces can be optimally discharged, and the tent provides reliable protection throughout the year. The fully galvanized steel pipes provide excellent protection against corrosion and weather and are less sensitive to shocks than e.g. powder coated steel pipes. 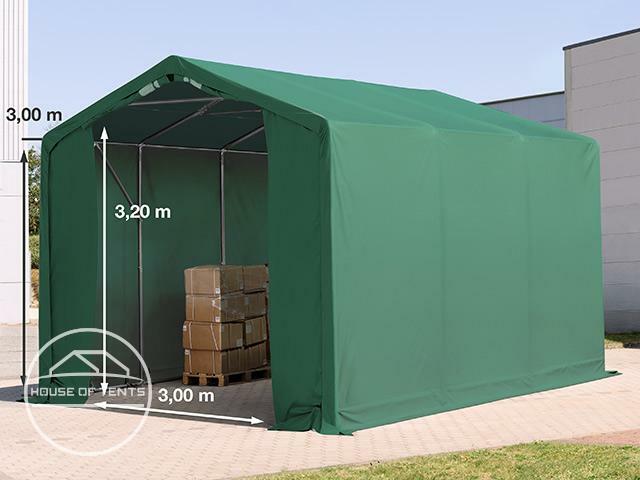 The material thicknesses are specially adapted to the high requirements, extend the period of use of this tent and make it so extremely robust and resistant. 5:Extra large feet - securely fastened all around! All steel pipes are fully galvanized, in comparison to the powder coated steel pipes, and protects against corrosion. With this sturdy bolt construction, all construction elements are firmly connected to each other with a bolt-screw connection. The use of additional reinforcing steel elements in the roof and sides derives weather-related forces, as well as targeted off. This makes this construction particularly resistant. The ground frame, overlying integrated tie rods and straps form a perfect unit. Extra large feet - securely fastened all around! Each pillar has a separate foot element. A foundation for anchoring needs not necessarily be given. The 550 g / m2 PVC tarpaulin is comparable to a truck tarpaulin. The tarpaulin has a patterned internal fabric, which makes the PVC tarpaulin tear-resistant and durable. The PVC tarpaulin is characterized by a high weathering and UV resistance and is very durable. With a temperature resistance of +50 to -20 ° C and a high UV protection of 80+, the PVC tarpaulin proves to be a reliable protection in every season. The glossy, smooth look is particularly low-maintenance and easy to clean. The continuous roof and sides tarpaulin consist of one piece, holds the frame together and is therefore an important part of the stability. Especially roofs that have been climbed are not waterproof - with us you get a 100% waterproof roof and not just one made of waterproof material. On both gable panels there is one entry in the double gate system – this means there are 3 zippers per gable panel. The manoeuvring height in the tent is 3,0 m.
The extended floor skirt lies around 30 cm on the ground and reliably protects the tent interior. High safety:The statics was set up by aGerman engineering office registered in the Association of Consulting Engineers (VBI). The statics handbook and all necessary parts for safe erection of the tent are included in the delivery. Anchoring is included, you may select between anchoring for or .Soil/Soft groundorHard/Concrete surfaces. For a nominal fee, we will send you the statics even before you buy the tent. In this case, please contact our experts at the following telephone number: 0118 31 50 873.
without prior knowledge thanks to easy-to-understand assembly instructions and marked parts. No extra tools needed for assembly. Always follow the instructions from the statics handbook. Fresh snow shall be removed swiftly from the tarpaulin in any case.